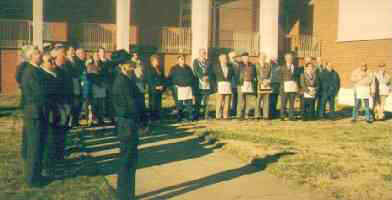 March 23, 1999 Salem Lodge Confers First Degree of 1999. Brother John Hulla, Jounior Warden performed in the East and conferred a perfect degree for our newest Brother Robert Lee Barber who is the son of Brother Earl Barbara. On Monday February 15, Salem Lodge 289 hosted a Special Flag raising ceremony at the Winston Salem Masonic Temple on Miller street. Winston-Salem Mayor Jack Cavanaugh was in attendance to read his Proclamation declaring the week of February 15 as George Washington Week in honor of the Bicentennial of Washington's death on December 14, 1779. A brief talk on George Washington and his Masonic career was presented by Ray Gaddis, Master Salem Lodge 289. Afterwards all joined for the reading of a prayer written by George Washington and hoisting of a special flag. A replica of Washington's Commander in Chief Flag that has been flown over Mount Vernon was raised in front of the Temple and the Pledge of Allegiance recited. 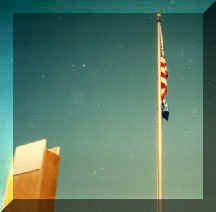 The flag was flown all week at the Temple to commemorate the George Washington bicentennial. As part of our Bicentennial program, Salem Lodge will also be presenting a set of school books on Washington to a local High School as well as hosting a History bee on Washington later in the year. Ray Gaddis Salem Lodge 289.